SIP 125 - Keeway Q.J. Funky, stylish, modern and big-time fun are the names of the game with Keeway’s amazingly playful SIP 125 scooter. One look at it and you immediately want to jump on and ride! Let’s go! 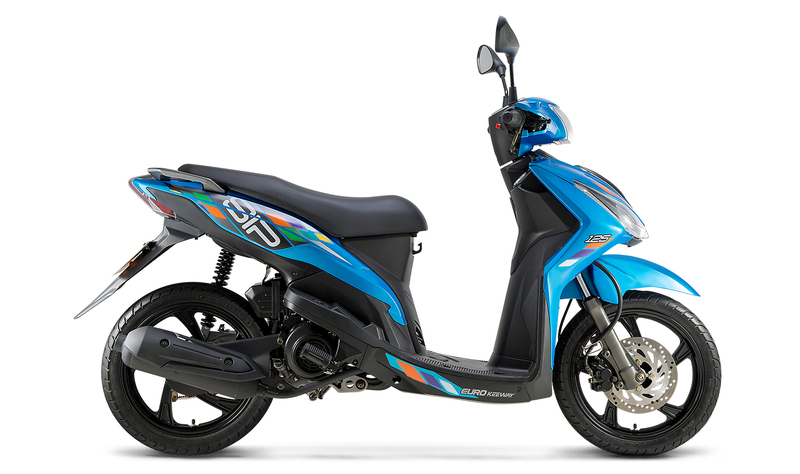 Covered by swoopy bodywork and crazy color schemes, the SIP 125 is all about moving – to work, to the store, to a party, wherever you need to go. A quiet and reliable 125cc four-stroke engine/driveline unit give you plenty of power, while a telescopic fork and single-shock system in back keep the ride smooth and carefree. There’s a disc brake up front for powerful stops, and grippy tires on racy-looking cast-alloy wheels for plenty of traction, around town or out in the country. The riding position is roomy, and the seat is super-plush – perfect for longer rides. The bottom line, however, is the SIP’s fun factor. You won’t find a more entertaining scooter anywhere! The SIP 125’s air-cooled, single-cylinder four-stroke engine/drive unit is reliable, surprisingly powerful and very easy to use, and pumps out plenty of smooth power. A single-shock system in back and a modern telescopic fork up front give the SIP a comfy and controlled ride, which is perfect for city or country runs. With a plush, two-person saddle, a roomy riding position, wide mirrors and low-vibration ride, the SIP 125 is easy to ride and plenty comfortable.